If you do this as well a reminder :) Always use precautions especially with children around and never leave candles unattended. After getting to know Wyk candles, I have learned the harms paraffin candles carry. The paraffin candles have harmful toxins in which some are carcinogenic. Some soy candles in the market only contain 25% soy unlike Wyk candles, which are 100% pure soy. Wyk candles are unique because it is made with 100% natural soy wax made in USA. The cotton wick is dipped around beeswax and is 100% paraffin free. These fragrant eco-friendly candles respect mother nature and lasts 30% to 40% longer than other candles. It doesn't leave soot or black residue. 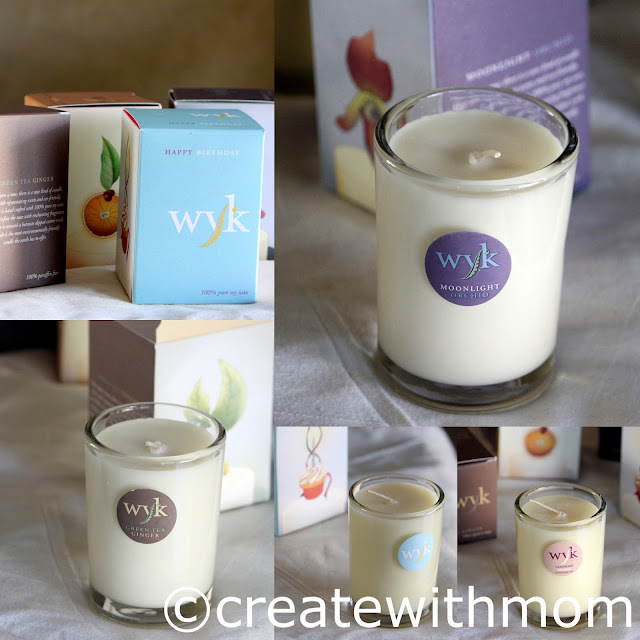 Wyk candles have a variety of fragrance combination some examples are cranberry orange cinnamon, moonlight orchid, green tea ginger, and happy birthday candles. Happy birthday candles would be perfect to smell and burn during a birthday or celebration as they have a wonderful cake like smell. We enjoyed the aroma from all these candles. The faint serene fragrance was calming and lasted even after the candles were put out. The smell was not overpowering or strong. The candles come in heavy glass tumblers and is not hot to touch. 100% soya candles don't come in pillars because it is softer than paraffin candles. The packaging reflects its simplicity and the friendliness of the product. The original award winning artwork on the package is beautiful and the boxes would be perfect to reuse and store things neatly i.e. crafts. Next time you purchase candles make sure it is made with 100% soy. Light candles using a gas lighter, not a matchstick because matchsticks produce sulfur. Enjoy the Wyk candles with everyone at home, as it is a safe healthy option for the environment and your children/family. Use up your paraffin candles for this painting and not for lighting. Celebrate Earth hour on March 31st 8:30 p.m. to 9:30 p.m. and every chance you get. Happy Earth hour everyone. I love the candles, the fact they it's natural makes it a winner. Very nice candles, happy Earth hour to you too! I love candles. Why do we have to wait for Earth Hour before we enjoy candlelight? It's soothing and romantic.